The Washita Chapter of the NSDAR met March 14, 2016 at the Cafe Clinton with Vice Regent Barbara O’Neill opening with the DAR ritual assisted by Evelyn Hart. Marilyn Wilson led the group in the Pledge of Allegiance and the Americans Creed. The group, accompanied by Doris Minor, sang American the Beautiful. The program was given by Tucker Blythe, Superintendent of the Washita Battlefield National Historic Site. 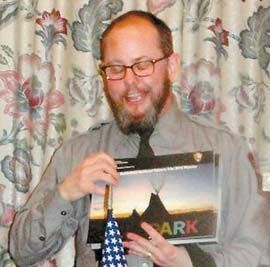 His program was given based on the test that he gave the group concerning facts about National Park System.